(MP129). Commander A M Hughes OBE RN. Pen and watercolour. Standard size: 10.25 x 12.25 ins (26 x 31 cms) approx. This was too tempting! A set of caricatures (produced by Commander A.M. Hughes OBE of the Gieves Silhouettes fame, probably in the 1920s) that used to adorn Messrs Gieves’ ("established 1785") announcement that their tailoring representative would be visiting such and such a wardroom on such and such a day. The caption that went with it was: "The officers....of Her Majesty's Fleet and the Royal Marines shall wear such uniforms as the Admiralty in persuance of His Majesty's pleasure shall from time to time direct" The wonderful little vignette of "First Command" placed in the centre seemed destined to be put together with the dress cartoons into a single picture! or whatever inscription you like. 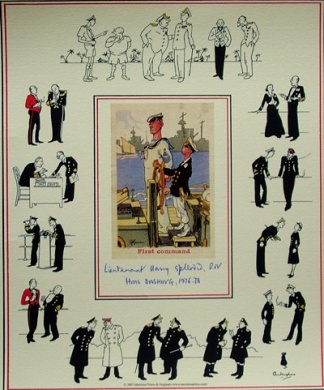 You, (now Vice Admiral Sir Harry Splendid), feel that their Lordships showed great perspicacity by giving you that early command and you’d like the picture in a prominent place in the downstairs cloakroom. Your wife (notwithstanding the fun of being Lady Splendid) thinks that the old man really has become impossibly self important and needs bringing down a peg or three so she, too, would like it hanging in the same place to remind him of his place and that he was once a green, young midshipman....!